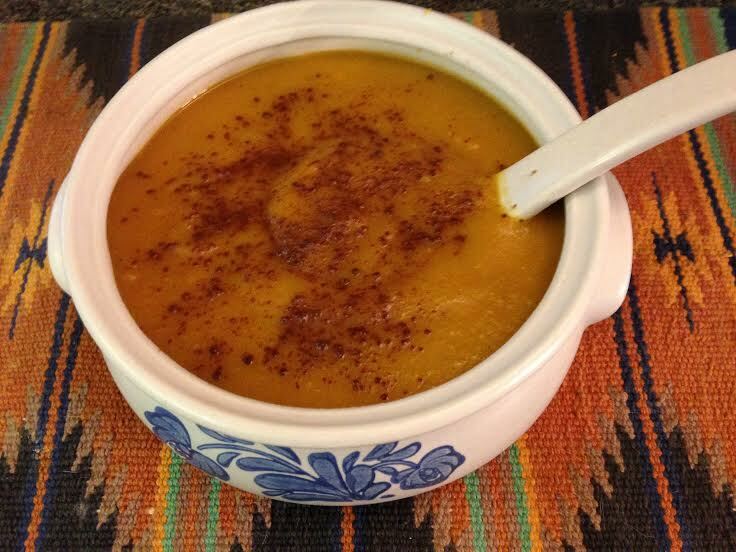 I love Butternut Squash soup all year round and one of my favorite recipes is a Butternut Squash and White Bean Soup that I have posted elsewhere on this Blog. But on a cold February day when large flakes of snow are falling outside a pot of Butternut Squash and Apple Soup simmering on the stove is just the comfort food I yearn for. The blend of apples in the soup adds a wonderful flavor reminiscent of the smells of fall and the holidays. The following is my adaptation of Michael Chiarello’s recipe which aired on the Food Network in 2006. 6 1/2 cups broth: Use either chicken or vegetable or you can use a mixture of the two. Heat the olive oil and melt the butter together in a large pot over medium heat and cook onions until slightly caramelized. Add garlic and saute briefly to release the fragrance. Add the squash and apples, raise the heat to high, and cook, stirring until the vegetables begin to caramelize, about 5 minutes. Add the coriander, cinnamon, sea salt, pepper and broth and bring to a simmer and partially cover. Adjust the heat to maintain a gentle simmer and cook until the squash and apples are tender, about 40 minutes. Using a hand blender, puree the soup and then a place in individual serving bowls. Garnish with a dusting of cinnamon and sprinkle with chopped pecans for a delicious bowl of comfort.